It feels great to have some one show how much they love you, but even better to do something special for the ones you love. Valentines Day is the perfect opportunity for the kids and I to do something special and out of the ordinary for the ones that we love. I definitely love the idea of Valentines Day, and since I’m lucky to be home with my kids I love to make it fun for them. I think it is just another opportunity to do a little something special for the people in our lives that love us day in and day out. It is something that I think is very important. I want to teach my children to do so from a very young age. I had my son almost 5 years ago. Since then I have taken the opportunity on Valentines Day to be sure that his Grandparents, friends, Aunts, Uncles, and Cousins know how very much they are loved. The tradition started with handmade cards, hand prints, and scribbles from my then 11 month old little boy. We made special cards and some cookies and hand delivered them on Valentines Day to anyone that we could. It was definitely more about stopping and saying I love You, than the “gifts” that we were giving. For those that we couldn’t see on Valentines Day we would send a picture in a card. My favorite year so far was when my kids were just one and three years old. We made a batch of cupcakes together to give away so our loved ones had a treat to enjoy during their lunch break. Because we were home all day we were able to deliver them to relatives at work before lunchtime. We also stopped and bought a bunch of roses at our local grocery store for about ten dollars. We spent the day delivering cupcakes to our family members at work along with one rose from each child. This was a complete surprise to all of the Grandparents, and their faces as the kids wobbled to them with their roses were absolutely priceless. I think the element of surprise along with something small to make their day extra special was the perfect way to show them that we were not only thinking about them, but making the effort to tell them in person on Valentines Day. So that is now our tradition. I know my days are number that we will be able to do this before the kids are gone at school all day, but I am really enjoying it while we can! Now that my son is in school, the little Miss and I might have to deliver a few treats without him, but I think it will be just as special. 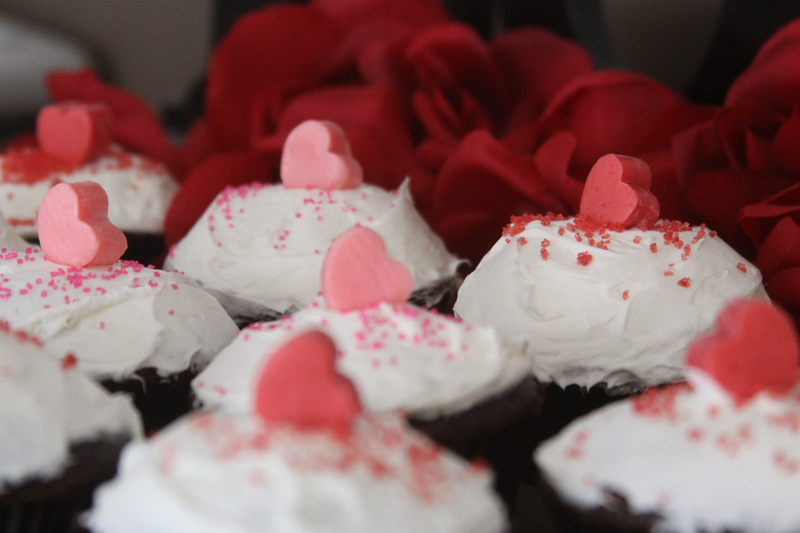 This year we are making simple chocolate cupcakes adorned with some adorable little hearts. 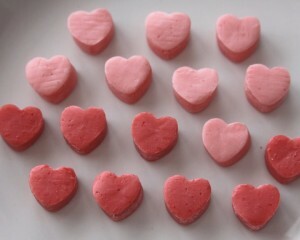 We got a package of Starbursts and cut out the hearts from the red and pink candies. They look so cute atop the frosted cupcakes with a few sprinkles. Thanks to Pinterest I have found a great way to package and delivery individually packaged cupcakes for Valentines Day. I saw the idea for Starburst hearts and wrapping them using a plastic cup all on Pinterest. The packaging for the cup cakes is such a great idea! It is so simple and pretty, and helps the cupcakes travel so much easier than a paper plate and saran wrap. We used some 9oz clear Solo plastic cups that come in a package of 40. Put 1 cupcake in a cup and put the cup inside a party clear party bag. We twisted it closed, added a little tie, and finished it off with one of our chalkboard paint covered gingerbread hearts. 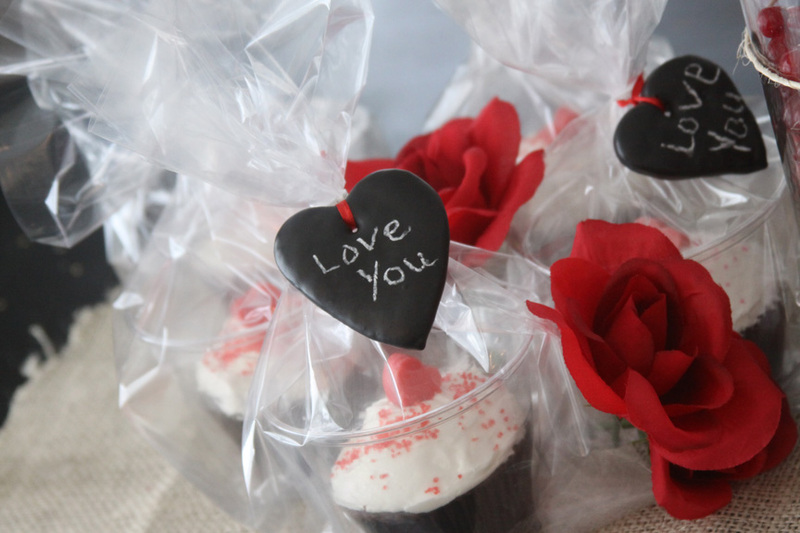 The chalkboard hearts added the perfect touch to make our cupcakes extra special and personalized. You can check out my tutorial on the chalkboard heart gift tage here if you want to make some yourself. I think we will spend an afternoon making cards for each person before Valentines Day. Then on the 14th we can deliver our goodies with a hug and a kiss. I hope that my kids will remember through the years how good they felt delivering something special, and that it is better to give than to receive. 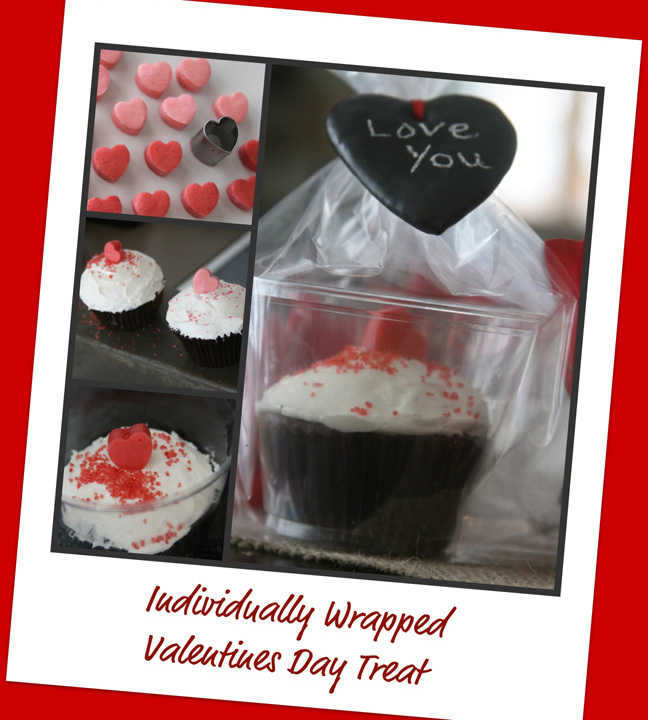 Delivery with your kiddos to the ones you love along with a single rose to make someones Valentines Day extra special! I think you should put all these wonderful holiday kid craft ideas and activities into a book! They are so doable, affordable, cute, and meaningful. It was good to see you at the party! It totally made my day when you told me that you did this with your kids for Valentine’s Day!! That is so SO awesome. Thanks for sharing my blog with others and I am thinking I am going to have to post your necklace headband idea soon!